We all know of how Sony experienced battery recall woes last year, causing a big dent into their accounting books at the end of the year. 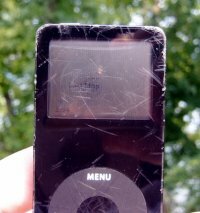 Guess it is time for the annual visit of the battery gremlin, and this time it is the iPod nano that suffers. A man from Atlanta claimed that his iPod nano actually burst into flames in his pants – and all this without even telling a single lie. The iPod nano which is nearly 2 years’ old, caused a fire that lasted for 15 seconds, reaching up to his chest. No word from Apple representatives at this moment, although the company has already sent a packet to Danny to return the iPod Nano. Any other battery horror stories from you folks out there? My baby blue ipod nano exploded in my pants, jarring my left nad loose. I liked it. My 2nd generation ipod started smoking out of the battery insert whole. It was rolling out like the battery had caught fire. it lasted for about `0 seconds and smelt awful. The metal plate on the back got so hot that i couldn’t hold onto it.